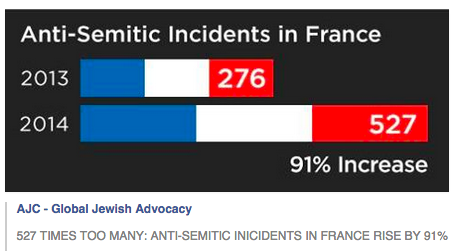 The AJC has published a “meme” that claims to show a 91% increase in anti-semitic incidents in France. But not quite as shocking when one looks further into the data. In 2013 the exact same news story of Jews fleeing French anti-semitism was also on the lips of journalists reporting about anti-semitism there. 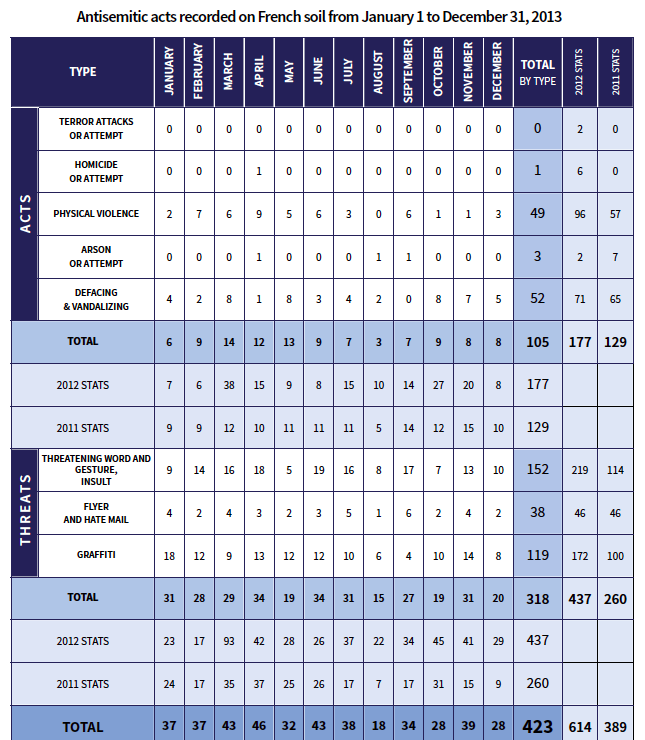 “The figures correlate with an explosion in anti-Semitic attacks registered last year: A total of 614 recorded incidents that constituted a 58 percent increase from 2011,” read one report. It seems the level of anti-semitic incidents rises up and down with a general trend being towards higher levels. For instance “between 1 September 2000 and 31 January 2002 405 anti-Semitic incidents were documented.” It depends on how they are reported. A CNN study showing a “dramatic rise” in 2009 claimed “The number of incidents in France rose from 50 to 195″ because they only looked at certain types of assaults and not verbal threats. So what is to be concluded. Yes, anti-semitism is up in France, but the “91% rise” figure is only conveniently employed to compare to 2013. Historically periods of conflict in Israel have seen dramatic rise in anti-semitism. It doesn’t mean there is any excuse for fascistic assaults on Jews; it just means that a deeper look at statistics and the continuing narrative of the “dramatic rise” needs to be more clearly spelled out. The media rarely reports when there is a decrease in anti-semitism…and that may not help give the public an accurate assessment.